Today I welcome Karen Tyrrell to Spinning Pearls to talk about her follow-up to Me & Her - titled, appropriately enough, Me & Him! 1. How did the experience of writing Me & Him compare with that of writing Me & Her? Writing Me and Her was a cathartic experience, healing from the traumas of parent-teacher abuse and mental illness. I wrote from two points of view, Me: mother, wife, teacher and writer. Her: psychic, healer to the living, telepathic to the dead and I was very psychotic. I wrote Me and Him as a conscious decision to share my healing tools with others. Me and Him comprises two books in one. A self- help book with a guide to recovery and to mental happiness. And a memoir of dramatic events as Him, my husband-carer, divulged new insights into my illness. 2. Which book took you longer to write, and why? Me and Her took six years and over 100 drafts to write, learning the craft of writing from the bottom up. Me and Him only took a year, utilizing my experiences as a memoir and mental health author, blogger and a magazine article writer. 3. How many editing passes do you usually make before you hire an outside editor? I re-drafted my book until I couldn’t improve it any more. Then I sent out my manuscript to beta readers for feedback and line editing. Finally I sought Affordable Manuscripts for final editing and proof reading. 4. Do you have any advice to give writers regarding self-editing? Complete a self-editing course like Queensland Writers Centre: Year of the Edit to learn structural and line editing. 5. If you self-edit, is there any need to hire an outside editor? YES, you need an experienced pair of eyes to pick up spelling, punctuation and grammatical mistakes as well as errors with the facts, logic and sequence. An editor will suggest improvements to formatting and word choice too. This ensures your manuscript is of the highest possible publishable standard. 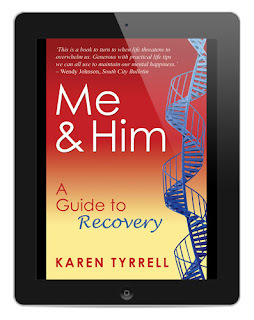 Email your Amazon receipt dated March10-17 to bonus@karentyrrell.com to claim this Special BONUS offer. Thanks, Karen! I've had the chance to read both these books and I recommend them to anyone with an interest in self-determination and mental health.